I have a great butcher in my neighbourhood. Apart from the complete lack of pork and inexpensive fish, they are pretty much the best. They get some amazing chicken from a local farmer just outside the city. It has way more flavour than anything I've had from the supermarket. They cut up whole chickens there, so the thighs (my favourite part of the chicken) end up with a bit of spine in them, and that means delicious marrow to eat later. I tried a different marinade than the traditional buttermilk, thinking the beer and yogurt would act the same way to tenderize the chicken. I patted them dry, coated them in barbeque sauce and cornmeal, and baked the thighs for 50 minutes at 350 in the oven. I grilled the drumsticks in my George Foreman grill for 30 minutes. They both turned out really well. 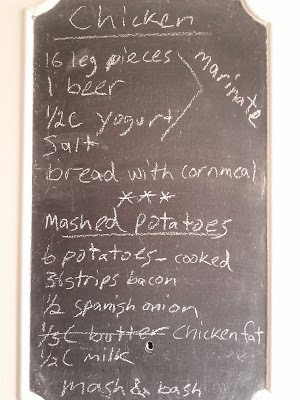 Mashed potatoes needed a bit of a kick, so I caramelized some onions and bacon to add. Instead of butter, I added the chicken drippings from the baked thighs and a few dashes of hot sauce. I will have a hard time going back to regular potatoes. These have raised the bar quite significantly. Next time I'll make them with cauliflower instead of potatoes to help with the nutrition factor. 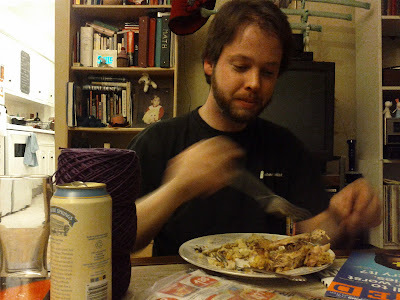 Here is a picture of Ian eating with super fast, ninja-like hands. His plate was full when I raised the camera; It must have been really tasty.